May reduce pain, heaviness and cramps in people suffering from venous insufficiency. Helps to improve venous tone and restore normal permeability to capillaries. 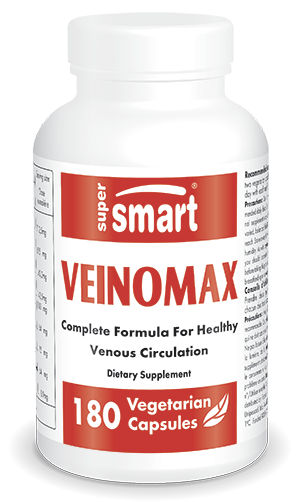 The plant extracts in VeinoMax are rich in active principles known to strengthen capillary walls and which act synergistically to improve vein health. ¤ Experimental and clinical studies have shown that troxerutin, a flavonoid, helps relieve heavy, painful, swollen legs and night cramps ; troxerutin reduces the severity of swollen ankles resulting from long-haul flights. ¤ Diosmin and hesperidin strengthen vein tone and elasticity, thus reducing the risk of varicose veins and haemorrhoids. Studies have shown that they have a beneficial effect on symptoms of venous insufficiency and on ulcers, when combined with conventional treatments such as support stockings. ¤ Horse chestnut extract strengthens vein tone, reduces the number and diameter of the small pores of capillary membranes, thus reducing the escape of fluid into surrounding tissues and helping to limit oedema. Over 100 scientific articles have been published on the benefits of horse chestnut in symptoms of chronic venous insufficiency. ¤ Blueberry extract, rich in antioxidant anthocyanadins, acts on vascular permeability and fragility. ¤ Grapeseed extract, rich in proanthocyanidins, has a beneficial effect on the symptoms of venous insufficiency, particularly in improving capillary fragility. ¤ Quercetin, a flavonoid, modifies eicosanoid biosynthesis and prevents platelet aggregation. Its anti-inflammatory properties help control heavy leg swelling. ¤ Hawthorn berry extract benefits cardiovascular health. ¤ Vitamin C, a powerful antioxidant, works in synergy with plant extracts to help fight oxidative stress ; and through its collagen-producing role, it helps improve the health of vein walls. Adults : take two vegetarian capsules three times a day with each main meal, or as advised by your therapist.